Responsive. Be polite and even gracious. With 94K Twitter followers, Lennar still makes a point of always acknowledging when their content is shared. That’s huge and it increases sharing tremendously. 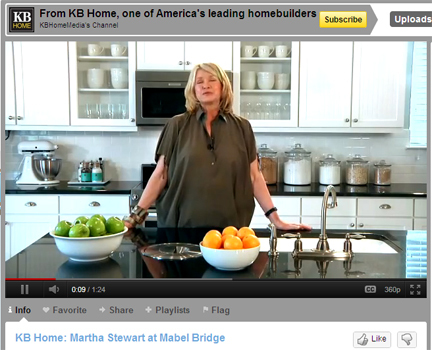 I have not found this consistency with any other brand managing this size of a following. 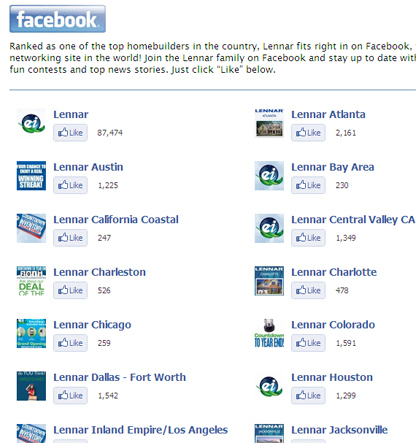 Sure – Lennar has resources, but the fact they choose to invest here speaks volumes of their commitment to social media. the test… I ran a small, highly unscientific Twitter test this past Saturday of 14 major homebuilders. Lennar responded first in an impressive 20 minutes (78% of the sample never responded…a social miss). 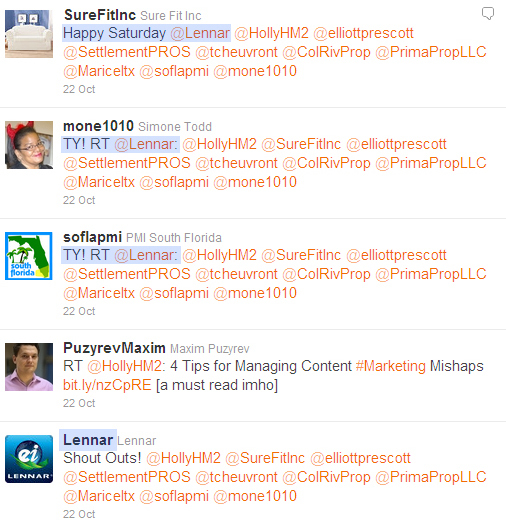 The Twitter stream below shows their “thank you” to me and others for sharing Lennar in some way. (Note: the first “tweet” is at the bottom). In 5 minutes, 3 people happily responded back. This brief, polite and likable exchange…resulted in Lennar’s name being positively shared with a network of 9,311 people in just those 3 tweets. Lots of small positive gestures add up in how people feel about your brand and it’s perfectly on-culture for Twitter. Transparent. Don’t hide from the negative. On Lennar’s Facebook page there are some good comments & some that make me cringe. The point is – they don’t take down the bad comments, they work with them. Building a home is much more complicated than say making a shirt. There will be a few really unhappy customers at all times. It is the nature of the industry. How those customers are worked with – is the difference. Also, Lennar allows people to post directly to their page and inserts personality. With your page open to the masses, you lose some control – but “control” has been gone for some time now. Let people have the option to take the conversation where they want to and your page will be more interestingly real. National & Local. “Corporate” and local profiles can be synergistic. These dual levels of profiles can “play off each other” in the social space and make the brand feel like a team. Also there is a subtle unity of voice among the divisions (some much more successful than others) and they are able to draw content from the work done at the national level, which is substantial. 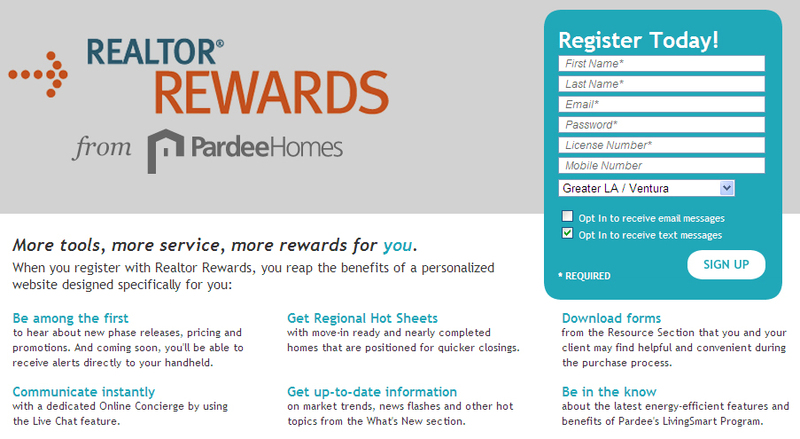 PARDEE HOMES (Regional CA/NV) – The first time I really took note of Pardee was years ago when I saw one of their demo rooms on ‘green’ features in a home (aka their SmartLiving platform). I believe they were one of the first homebuilders to seriously integrate sustainability into their brand and with social media the innovation is continuing. Innovative Programs. Create valuable content for target audiences. Pardee has developed some strong support programs for Realtors and homebuyers working through the challenges of this market and qualifying today. The programs play out nicely online and are positioned well when shared in social media. Integrates Content Type. Blend your content & don’t over-sell in social media. Pardee does a good job of blending their promotional content and helpful resources – with interesting items related to their business or the social channel they are on. It’s a nice combination. Bold & Interesting. Valencia’s ‘Awesometown’ campaign was a big, bold, and unapologetic “high-five” for life in Valencia. Engaging, fun, sort of obnoxious and crafted to resonate with families in social media, which it did. “Awesometown” started off as a HOT neighborhood (& industry) controversy that actually made the news. Today local residents & businesses have added “Awesometown” to their vocabulary, as seen in the local Ralph’s cola display and all over social media. On Facebook various contests and colorful content keep Valencia from fading into the background and the engagement high on their page. FINAL KEY POINTS: Be Responsive • Be Transparent (no editing the uncomfortable) • Match Content & Communication Style to the Social Channel. Hi Holly! Thanks so much for the shout out – honored to be included on this list. Have a wonderful Halloween! Hi Holly – We most definitely appreciate you noticing our Lennar efforts nationwide and thank you for your kind words. We have a great team at Lennar and we have done what we have done on a shoestring budget and with no additional resources to date. Hi Holly – thanks so much for your acknowledgement of the Awesometown campaign. We are amazed every day at how it lives on via social media, and especially with how the local business community has and continues to embrace it. As Kay indicated above, it’s been a great way to reach out to an overwhelming number of people and in some cases a whole new audience, while staying within budgets that are certainly much slimmer than what we’ve seen in years past. Always enjoy your insights, and look forward to your posts. Hi Caryn! Happy to acknowledge such an “awesome” effort in the social space and I’ve enjoyed seeing it play out. 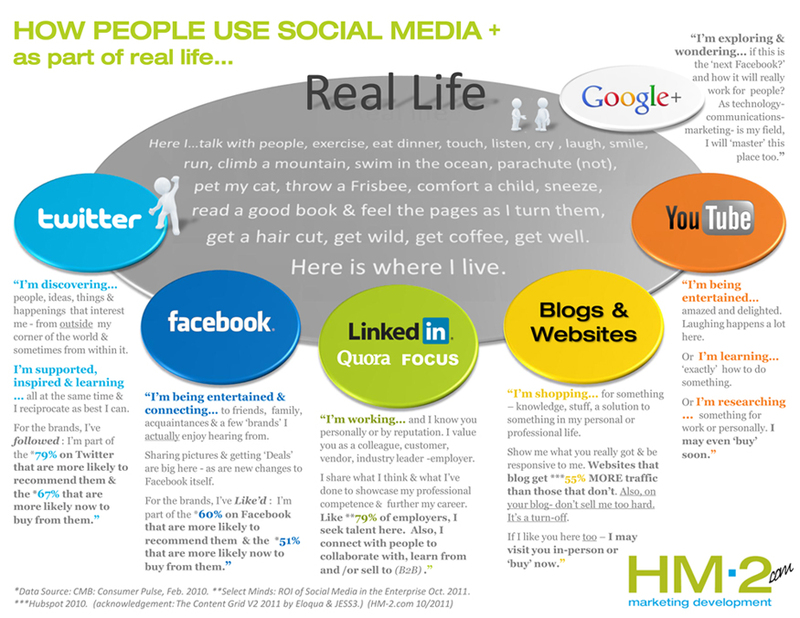 inspire people to explore the possibilities of strategically adopting social media into their marketing mix. As always, Holly, your insights are spot on and your posts interesting to those of us in the building industry. Hope to work with you on another project again soon!